Silver warehou are common around the South Island and on the Chatham Rise in depths of 200–800 m. The majority of the commercial catch is taken from the Chatham Rise, Canterbury Bight, southeast of Stewart Island and the west coast of the South Island. Silver warehou is managed by the Ministry for Primary Industries and has been part of the Quota Management System (QMS) since 1986. The Ministry works in partnership with Deepwater Group (a not for profit organisation that works on behalf of fisheries quota owners) to manage and monitor various aspect of the fishery. There are no current recreational fisheries for silver warehou. The risk assessment covers roughly 85% of all silver warehou caught in New Zealand. No estimates of silver warehou biomass are available and the status of the stocks are unknown. There are no stock assessments available for any silver warehou stocks. Neither the trawl survey nor the catch per unit effort (CPUE) time series are currently suitable for monitoring the stocks or useful for stock assessments. While commercial removals from the fishery are closely monitored through the QMS reporting arrangements, with validation from observers, there is no reliable index of abundance available at this stage. 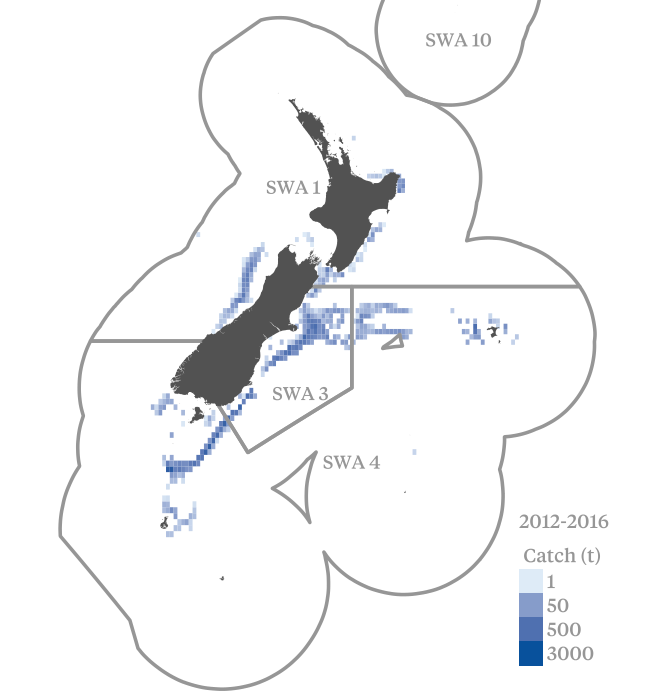 In most years from 2000–01 to 2008–09, catches in SWA 3 and SWA 4 were well above the Total Allowable Commercial Catch (TACC) as fishers landed catches well in excess of Annual Catch Entitlement (ACE) holdings. The sustainability of current TACCs and recent catch levels for these fish stocks is not known, and it is not known if they will allow the stocks to move towards a size that will support the maximum sustainable yield. Periodic review of stock status and recommended Total Allowable Catch levels through the government Working Group process. Silver warehou is taken in targeted trawls, as well as trawls targeted at other species (e.g. hoki, barracouta, hake). While information to evaluate the total catch composition of trawls taking silver warehou is complicated because it is frequently taken as a bycatch in other targeted fisheries in SWA 3, sufficient information appears to be available to determine the impacts on likely main other species with respect to status and to detect increased risk to them. The main limitation appears to be a lack of detailed information on full catch composition, including discards. In SWA 4, very good quantitative information is available for some species (hoki, hake) and is sufficient to detect the impact of the fishery with respect to status. For BAR 4, quantitative information is available, however the fishery has been highly variable and no standardised analysis is possible. There is limited information on endangered, threatened and protected (ETP) species interactions specific to silver warehou targeted trawls, although it is taken in the same depth range and at the same time as hoki, hake and barracouta targeted trawls so we have assumed ETP species interactions and risks will be similar to these fisheries. On that basis, the main potential ETP species interactions are likely to be with seabirds, marine mammals and protected corals. It appears highly likely that current rates of capture are not hindering recovery of marine mammal species or protected corals. The existing seabird mitigation strategies also appears likely to ensure the trawl fishery does not hinder recovery of seabird species. The management system relevant to silver warehou has explicit short and long-term objectives which are set out in long-term plans e.g., Fisheries 2030, National Fisheries Plan and Annual Operational Plans. Objectives are subject to an annual review report and are explicit within the fishery’s management system. The stock structure of silver warehou is not known. There are no stock assessments available for any silver warehou stocks. No estimates of biomass are available and the status of the stocks are unknown. The sustainability of current TACCs and recent catch levels for SWA 3 and SWA 4 is not known. Target species - Uncertain: McGregor (2016) outlines a range of work that could be undertaken to make Catch per Unit Effort (CPUE) data more reliable as an indicator of stock abundance, although it is not known when the work will occur. Management systems - Stable: No major changes to existing management system arrangements are expected.